Edit: thank you so much for all your help. You made this change a positive one. My son was diagnosed with autism in April and, in that month, I didn’t know if I would ever have a normal Easter Egg hunt with him. He wandered around aimlessly and, since he didn’t understand pointing and only intermittently responded to his name, our attempts to teach him how to hunt eggs were futile. 17 months old, he showed no understanding of words despite being in Speech Therapy for 2 months. His skills lagged behind that of his twin, even though he’d been in Occupational Therapy for over half a year. I used my knowledge of behavioral studies in monkeys to conduct various assessments of how many words he understood and, when he started to finally pick up words at the end of that month, I could tell he was still far behind his peers. We started Applied behavior Analysis (ABA) therapy as soon as he turned 18 months in May. On Nov 4th, he’ll be 2, and in that time, the change he has undergone could be said to be miraculous, it is so dramatic. He went from having severe speech delays in both categories to having a healthy receptive vocabulary (how much he understands) and an expressive vocabulary (how much he can speak) in the normal range. He points, seeks out my attention when he plays games, engages in imagination play, and kisses me and his stuffed animals. He’s still very much autistic, but because of ABA, it is highly likely that he will be able to share a classroom with his neurotypical twin brother. As a military family, we have Tricare, which is the health insurance program used by military personnel, military retirees, and their dependents. Tricare recently announced some new changes to their policy on ABA therapy, which is what is used to treat dependent autistic children. Although some of these changes are positive, others will negatively impact autistic children and their military families. You can read the policy and a summary of the changes here, in another blog post. Presumably, these negative changes were made to save money, but not only will they negatively impact the children of our troops, they will end up costing us much more in the long run. The cost of Early Intervention is much less than cost of leaving autism untreated. Many studies show that “early behavioral intervention is associated with normalized brain activity in children with autism”. These studies have “demonstrated considerable IQ and speech gains and much better functioning in elementary school for children receiving intensive and specialized intervention by age 3”. In a cost-benefit estimate [PDF] for early intensive behavioral intervention conducted in 1998, the authors conclude that the savings of 3 years of EI between 2 and school entry can save an estimated $187,000 to $203,000 per child ages 3-22 years, and from $656,000 to $1,082,000 per child for ages 3-55 years with an initial cost of $33,000 to $50,000 per year [Tricare currently caps ABA at $36,000 per year, although with the new changes, there will be no lifetime cap or yearly cap]. As diagnosis age slips lower and knowledge improves, it is reasonable to assume that the savings rate is even higher now. Early Intervention is clearly important, but why ABA in particular? Why not obtain coverage outside of the military? Putting aside that this question ignores the existence of dual-military families, despite the clear benefits to Early Intervention and ABA, North Carolina is one of the few states where insurance companies are not required to cover ABA, although a bill is moving forward. As a military spouse, even if I were to quit my current part time job and manage to land one in this poor economy, it is highly unlikely that my insurance company will cover ABA therapy. North Carolina has cut $18 million from the NC Infant-Toddler program, which means that my son was unable to receive Play Therapy, an alternative to ABA that had previously been offered through the state. Even for military families in states that provide good coverage, it is very difficult for spouses to get jobs with benefits, if they can get one. The Military Officers Association of America released a study that found that 90% of military spouses are underemployed and are 30% more likely than their civilian counterparts to be unemployed. If the constant moves, deployments, training sessions, and other difficulties didn’t make matters hard enough, most mothers of autistic children said that they worked fewer hours to take care of their children. Individuals who are medically retired due to disability may be limited in the work available to them. It is not just that autistic children tend to require higher supervision and for longer periods of time than neurotypical children, my autistic son receives about 20 hours a week worth of therapies, most of which strongly encourage my presence if not my participation in order that we can work on various skills outside his official hours of therapy. For military families stationed overseas, the local networks may not provide enough support to handle ABA therapy appropriately. If a family qualifies for Medicaid, then the family will be covered, as there are new guidelines require that autism treatments, such as ABA, must be covered up to age 21, but a military family shouldn’t be forced to apply for Medicaid in order to receive the treatments their children need. Our military men and women put their lives on the line for the country and we repay them by denying their families, especially their children, the full services they need? For non-active duty family members, the new policy requires a 10% copay. For our family, that would amount to $250/month, and the Operations Manual acknowledges that the cost share can be $125 to $200 per week, which is cost prohibitive for many families. NADFM includes those retired after 20 or more years of service to our country sand those medically retired. The least we can do is help their children receive the medical services they need. While Early Intervention and ABA are important, these new changes have some benefits such as no lifetime cap, no annual limit, and no maximum age for beneficiaries. Not all of these new changes are bad. The no annual limit, no maximum age, no lifetime cap, and a few other policy changes are very good. Some policies have effects that remain to be seen. For example, in some areas, not allowing BCaBAs to be independent ABA providers has limited access to care. While I applaud a higher national standard for ABAs in terms of education and training, raising standards while cutting reimbursement rates to providers is likely to result in a greater shortage of care. Rates to BCBAs (Board Certified Behavior Analyst) were slashed in half and the rates to the BCaBAs (Board Certified Assistant Behavior Analyst) fell even further, so both rates are now outside market value in many areas. Also of huge concern is the reduction of skills for focused intervention. Before, 10 skills were targeted: social, communication, behavior, mental health, vocational, adaptive, motor, academic, cognitive, and developmental. Now, only 3: social, communication, and behavior are targeted. Although there is a strong argument that a potty trained child (adaptive skill) who is able to feed themselves will be much better equipped to handle mainstream school, and therefore, potty training could be considering a social skill, ABA specialists need to be able to properly code these deficits in order to receive reimbursement for the therapy. As the new standards require an ASD diagnosis by a specialized ASD provider or the ADOS-2, these services will only be used by autistic family members. While ABA is designed to be useful within the school setting, parents often have to fight to get permission for their children’s therapists to accompany them to school. With recommendations of ABA reaching as high as 20-40 hours a week, it can be very difficult to get enough therapy if the therapists are not permitted in the classroom. Not to mention, the best place to teach social skills is in a social setting, such a classroom. I try to take my son to playdates and parks, but he’ll receive the most benefit to his social skills in a classroom with an ABA therapist at his side. However, without academics as an area of concern, it will be even harder for parents to convince school authorities to allow their children access to their therapists, and many BCBAs have said that they believe the changes will make it impossible for them to enter schools. It is only after becoming involved in the autism community that I have become aware of how hostile some teachers can be towards their autistic students, with a frightening number of stories of teachers who were abusing their autistic children. Currently there is no federal law that prohibits the use of restraints that restrict breathing, and locked seclusion, in public and private schools, although more than 20 students, many with disabilities, have died to seclusion and restraints being used in schools. Even well-intentioned teachers who fail to understand the peculiarities of autism might see a student as combative or disruptive when the student is only trying to be helpful. As many teachers here have reported classrooms of 30+ students (since there is no limit on class size in North Carolina), having an extra adult in the classroom, especially one trained in child behavior, will also help the other students. Not only will it benefit students to have their therapists in the classroom, it could even save lives. Autistic children frequently attempt to leave a safe environment at a rate nearly 4 times their unaffected siblings. These wanderings are responsible for making drowning the leading cause of death amongst autistic children 14 and younger at a rate of 91%. Autistic children have drowned on field trips and after eloping from their schools. I have seen first hand the danger of water to some autistic children when my son started walking into a lake at a family picnic and basically didn’t stop. I had to hold onto him to stop him from walking far out into the lake. ABA therapists can not only teach autistic children to remain safely in their schools, they can provide an extra eye in over-filled classrooms. It is not an exaggeration to say that ABA therapy can save lives. Another area of concern with the new ABA policy is the 2 year limit placed on therapy with Tricare conducting a review before authorizing more care, as well as the harsher discharge criteria, and requirements for a discharge plan and projected duration. Some children respond well to ABA therapy, while other children, particularly those with intelligent disorders in addition to autism, require much more intensive work and are likely to need ABA therapy for many years. At this point, there is no way to know which children will move to mainstream schools and which ones will need lifelong care, other than we know that those who receive ABA are more likely to move so far up the spectrum, they are sometimes considered ‘recovered’ from autism. It is possible that Tricare will hire those trained in ABA therapy to conduct the reviews at the end of the 2 year, but it is also likely that the regional contractor will not have the necessary training. Already, Tricare requires a referral renewal each year. If a developmental pediatrician and an BCBA both agree that a child is autistic and requires ABA therapy, it is highly unlikely that the child does not. Since autistic individuals are known to regress during times of stress, and military children are 2.5 times more likely to develop psychological problems than American children in general, it is reasonable to expect that autistic military children will experience more regressions and difficulties in progression compared to a child in a civilian family. Autistic children like routine and stability, both of which are hard to maintain when families move an average of once every three years and most military children attend 6 to 9 different schools between kindergarten and 12th grade. Having a deployed parent increases a child’s risk for emotional and behavioral problems, and for autistic children with speech difficulties, it can hard to convey to them why the parent has left and when the parent can be expected to return (or even that the parent will return). Autistic children are sometimes thought to not be attached at all to their caregivers, but all of my military friends with autistic children have observed issues that arise when deployments or field training exercises happen. Of my twins, my autistic one was the one who more openly showed how much he missed his father and how happy he was upon daddy’s return. The ABA therapists, who work closely with families, have a much better judge of the current stressors and complications impeding the child’s development. That’s why it is critically important that the therapists’ professional opinion (along with a developmental pediatrician or similar professional) is used to determine the success or lack thereof of ABA therapy, rather than third party who will only review the current progress compared to the past. The last thing we need to place upon the shoulders of our military members is stress about the health of their children. ABA therapy can be the difference between an autistic child requiring Social Security and a group home, and one who is fully independent. Because of the cost effectiveness of Early Intervention and ABA therapy in particular, there is no reason to restrict it beyond its current levels, especially in the school setting, one area where it is desperately needed. 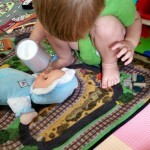 2.5 months after starting ABA therapy, he spontaneously pretended to feed the doll after observing me pretending to feed it while playing with both boys. Lack of pretend play is a characteristic of autism.